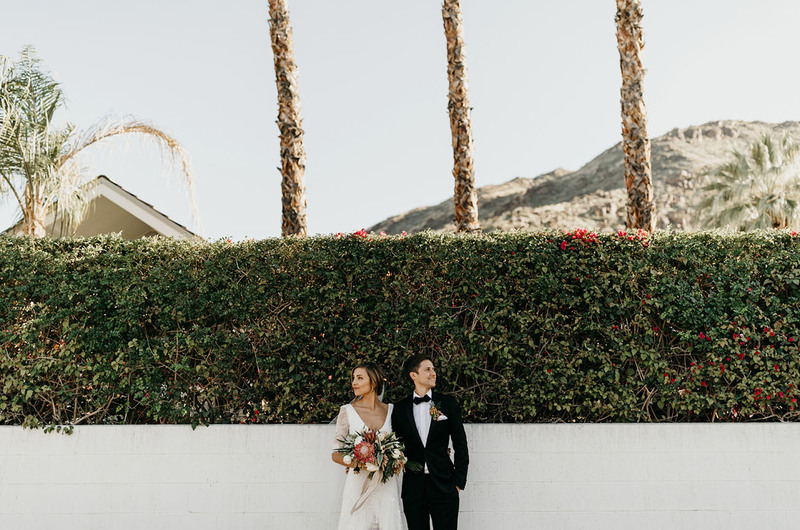 Danielle + Jason wanted the feeling of a destination wedding, without all the crazy travel involved. 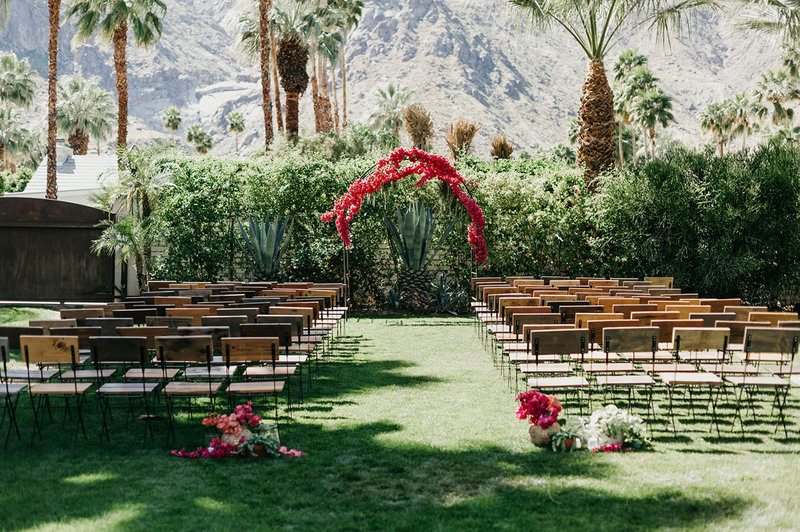 So, from their home of Tucson, Arizona, they thought Palm Springs would be the best option! It had the quintessential vacation vibe they so desired + it was close enough to home — win, win! 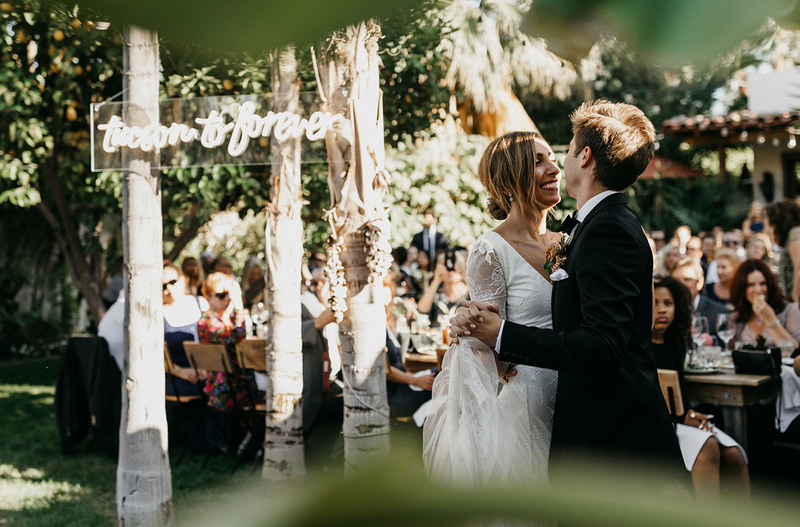 When it came to designing the day, D+J teamed up with Angelena of Shindig Chic to make their dreams come to fruition. 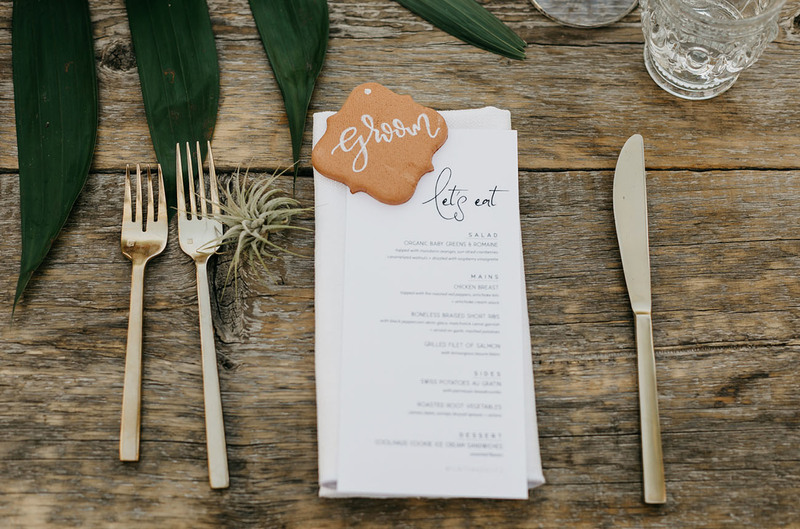 Danielle shares My colors and design details came after I chose my venue. 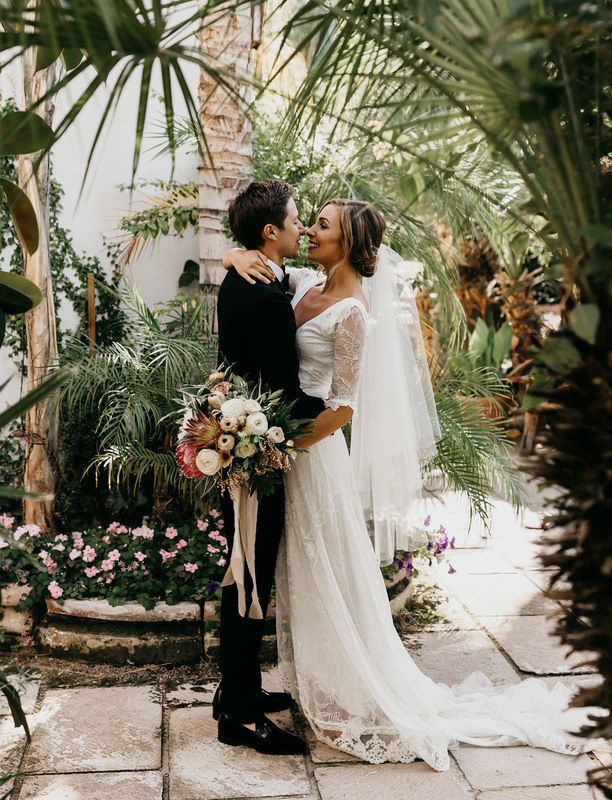 Casa De Monte Vista is the most magical place; it’s a big lush garden with Moroccan and Spanish accents. I wanted to create a color scheme that accentuated the natural beauty of the property. 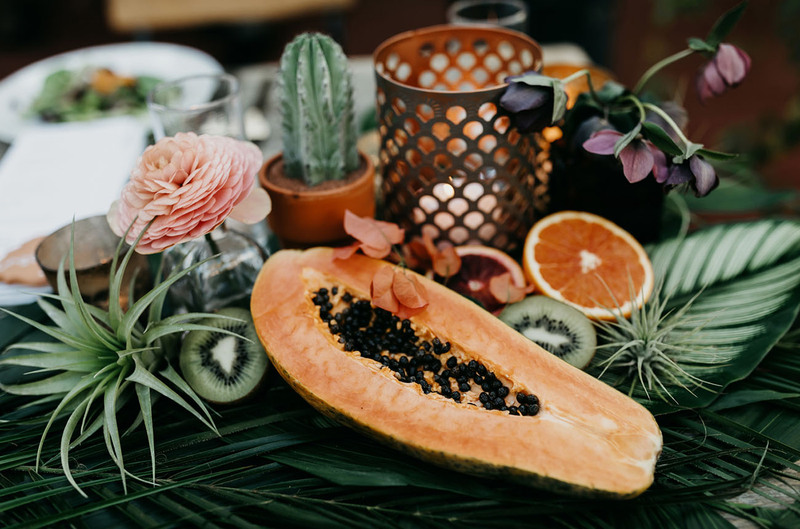 I chose soft, earth tone colors and incorporated wood, terra cotta and fruits into all the décor. 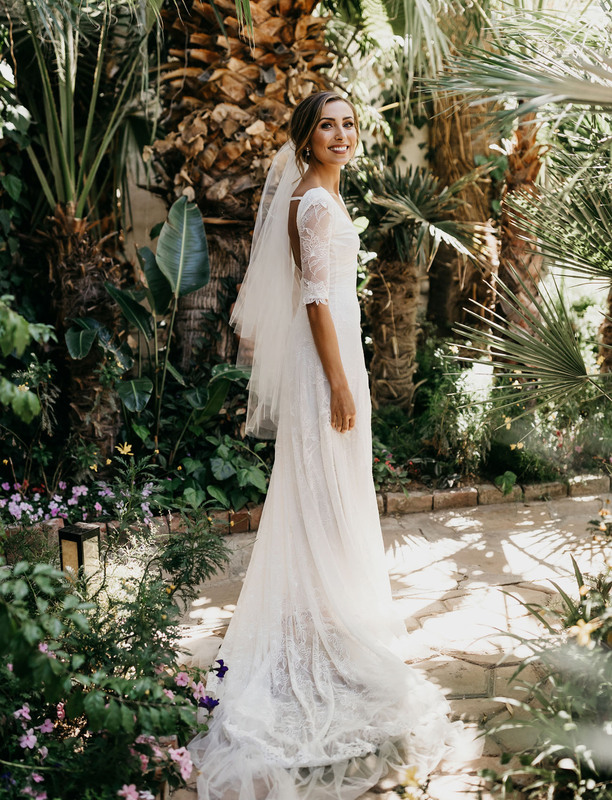 We love that they kept things feeling organic to the location. Danielle’s biggest takeaway from the whole process? 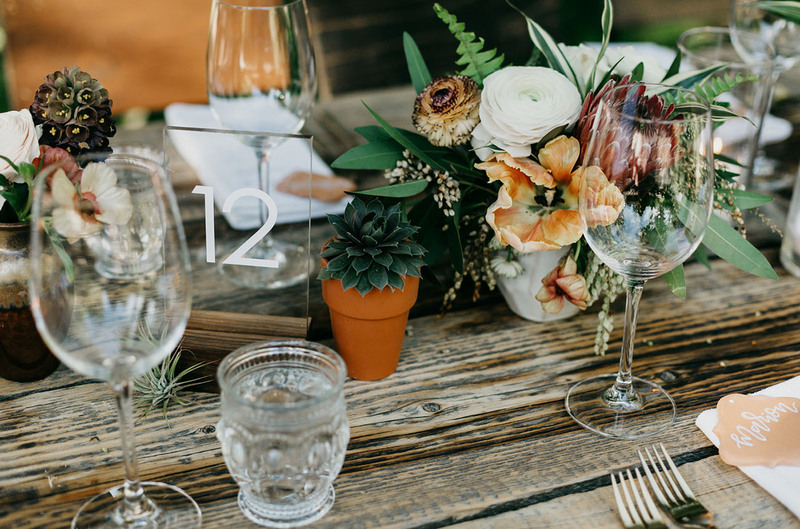 Find vendors you trust + that really vibe with what you’re doing — that’s where the magic happens. Now, let’s visit this bougainvillea dreamland captured by Nicole Leever! 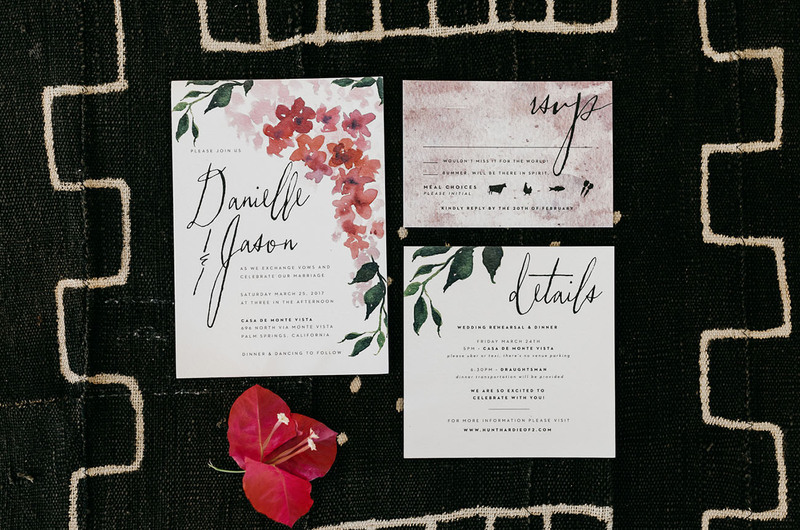 How gorgeous is this water color invitation suite?! We love the incorporation of the leafy bougainvillea. 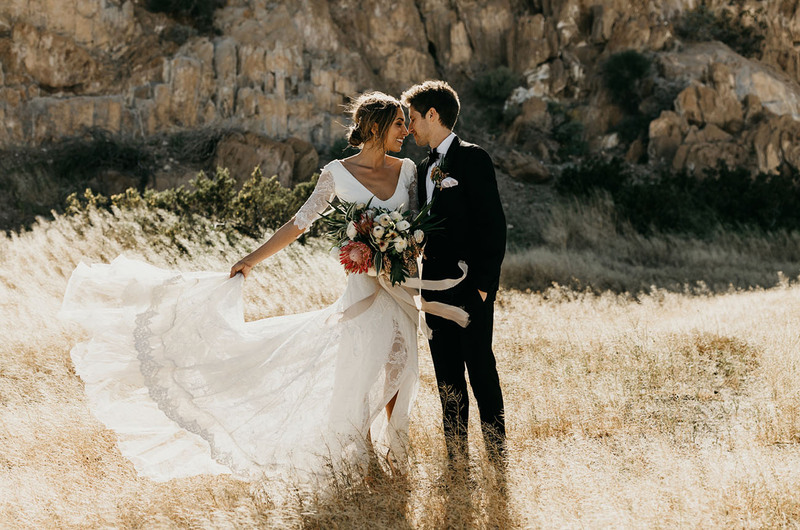 That gorgeous lace wedding dress? It’s by none other than Grace Loves Lace. 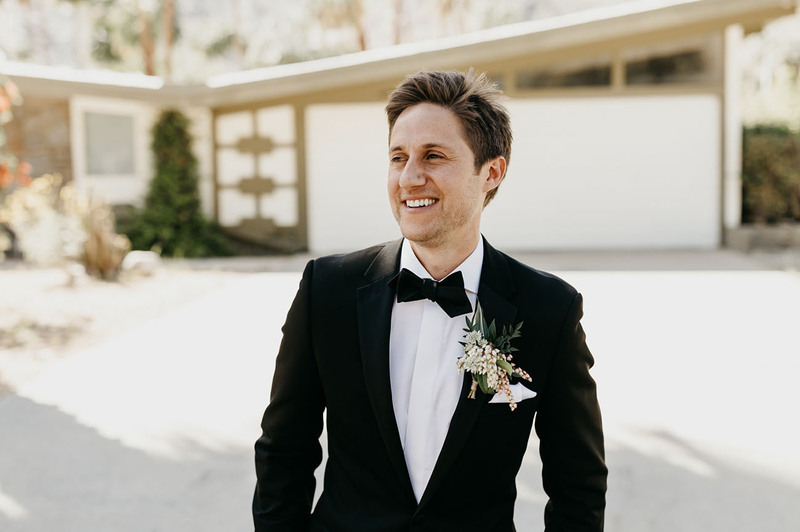 Lookin’ SHARP! 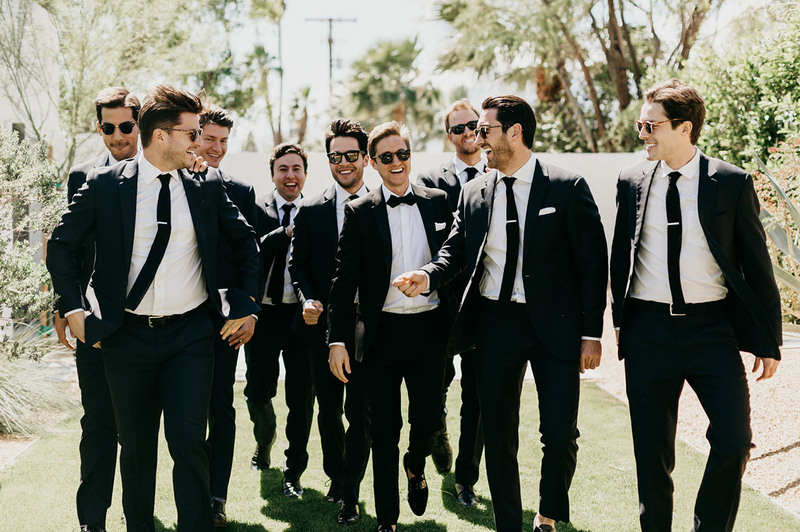 The groom donned a tux by Sandro, while the groomsmen were outfitted in suits from The Black Tux. Hands down my favorite part was seeing Jay for the first time. 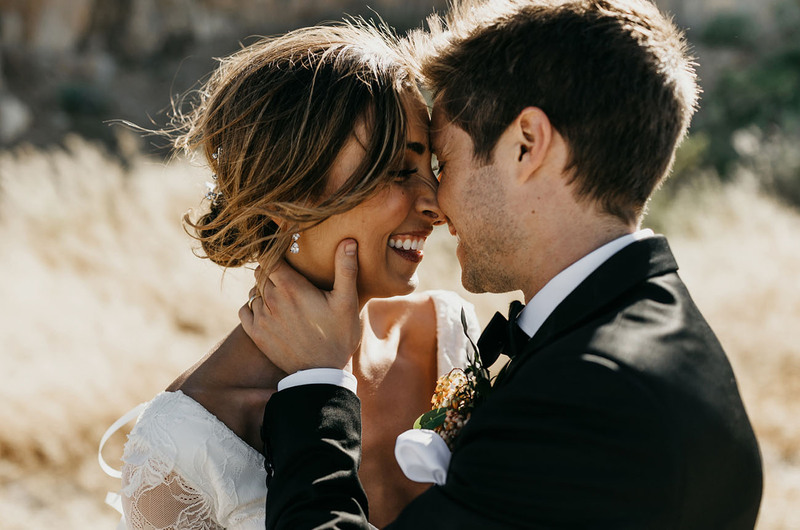 I was a little nervous and anxious but when I saw him during our first look all my nerves instantly turned into excitement. It was the perfect start to the day! 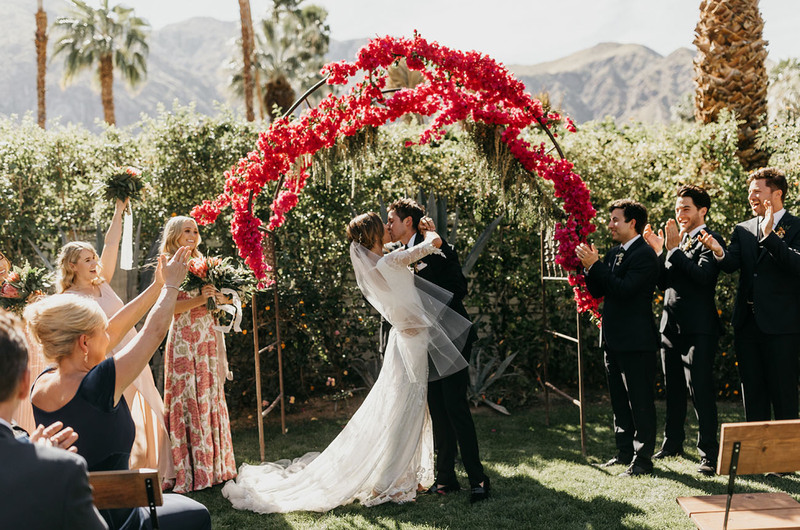 Isn’t that bougainvillea floral arch incredible?! 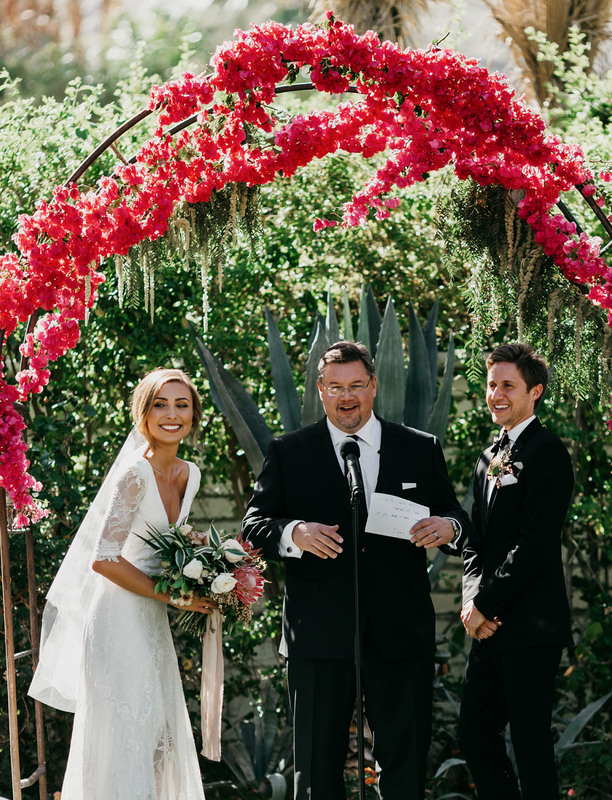 You can literally feel the emotion in this photo… Pure joy + happiness!! 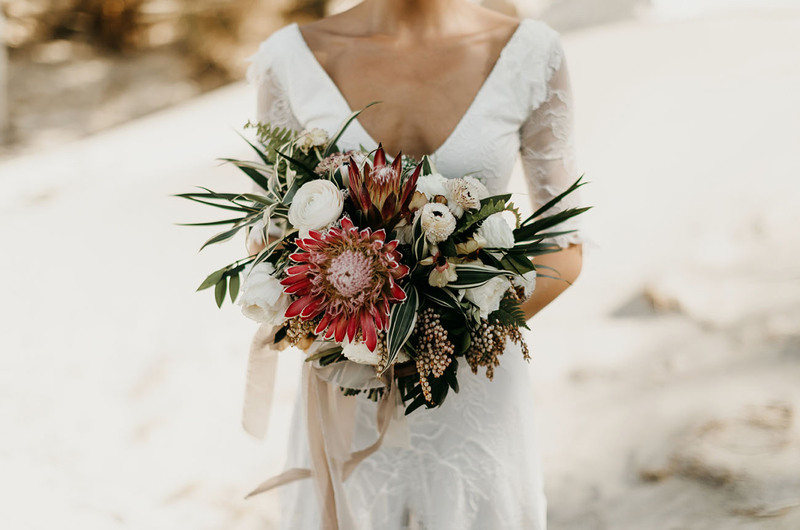 To complement the bright pops of bougainvillea seen throughout the day, Shindig Chic crafted this vibrant pink + white bouquet, complete with king protea + lots of texture! 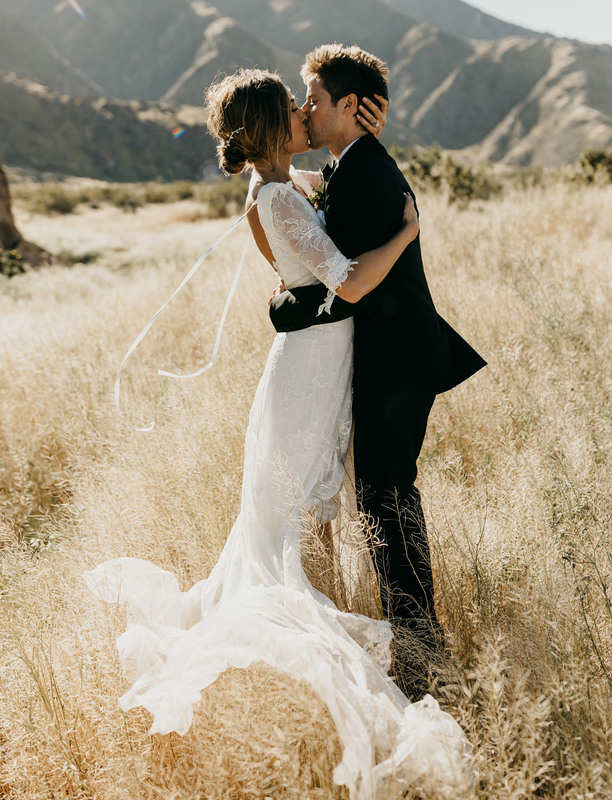 I absolutely loved our adventure out to the desert to take photos after the ceremony. 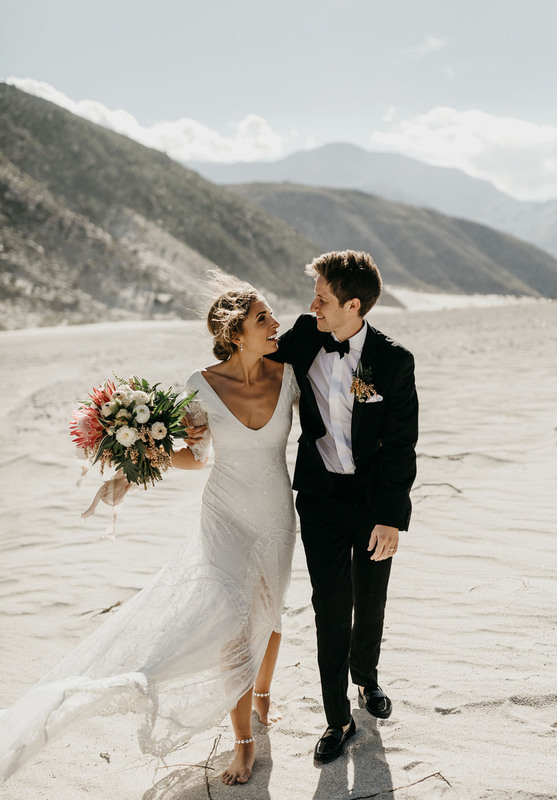 It was crazy windy (my hair was falling out, sand was in our eyes, branches were sticking to my dress) but we were on such a high and had the most amazing time with our photographer and videographer. 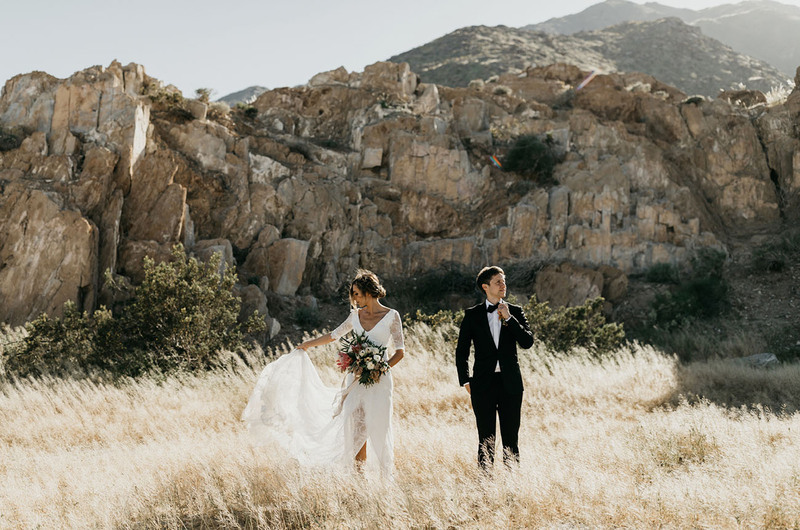 I don’t think I would have ever agreed to this had I not trusted them and their vision…and I’m so glad we did because the photos are incredible! Choose your vendors wisely! Do research, make sure you guys vibe and that you can trust them. Good vendors make all the difference in the world! Have fun with it! Don't let it stress you out — don't let things you can't control ruin it for you! Also, ask for help! 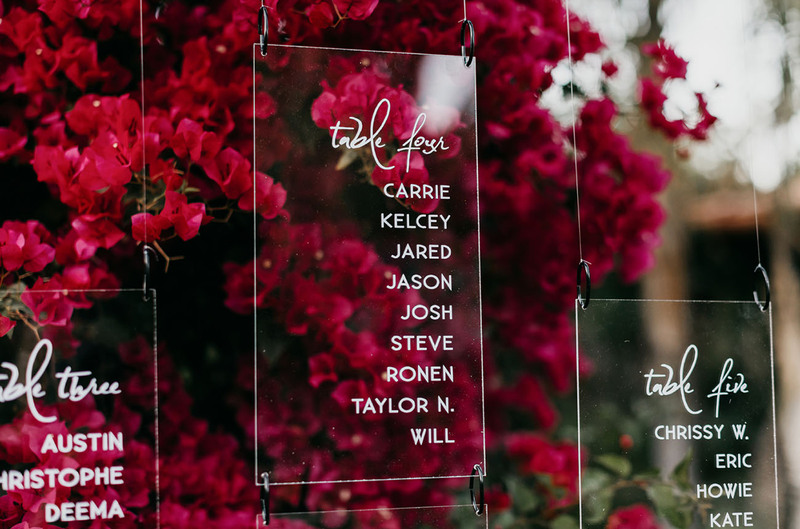 My family and friends were so incredibly helpful not just the day-of, but the months leading up to the wedding and I truly don't think I could have done it without them. 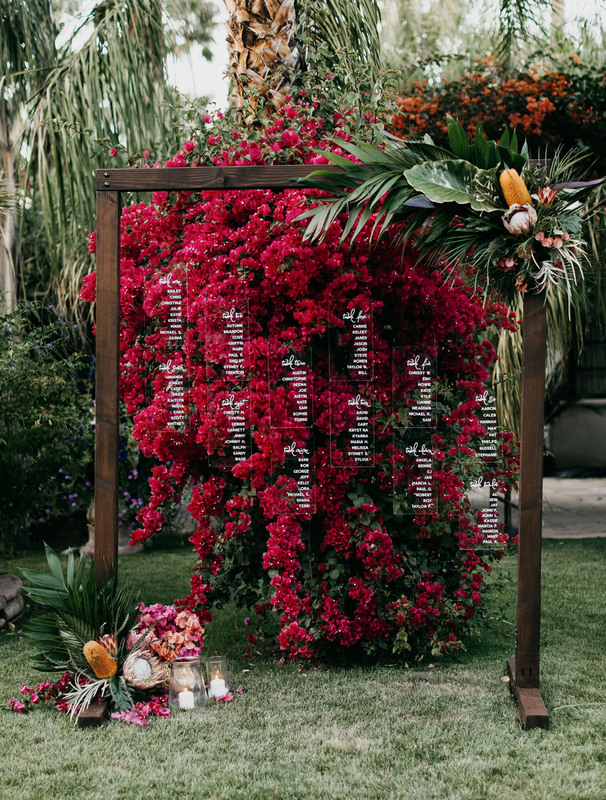 We’re ALL about that bougainvillea! 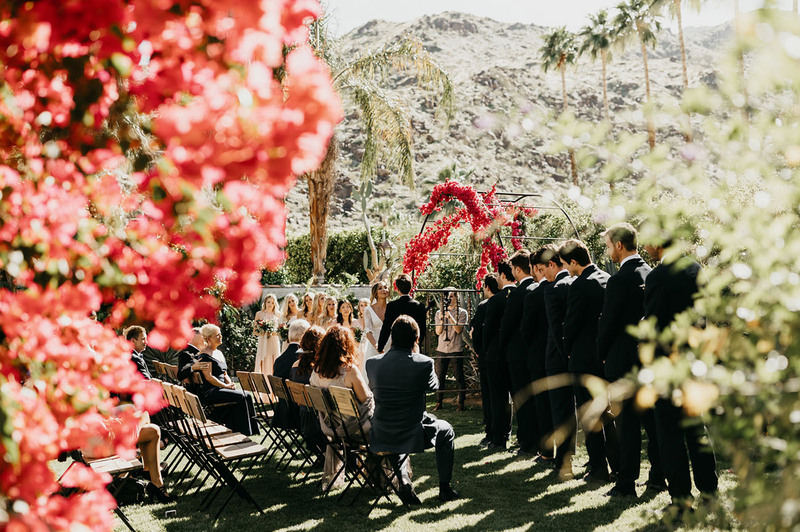 Angelena of Shindig Chic tells us: We really used Palm Springs as our inspiration because it is such a unique blend of desert + tropical elements everywhere you turn. 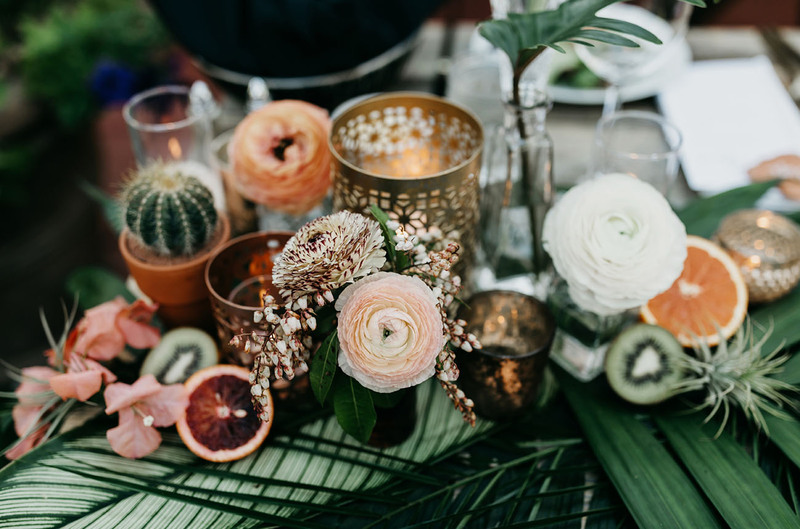 It’s the rare place where you can mix cacti, bougainvillea, sliced fruits, palm fronds & spring blooms and have it still work flawlessly! 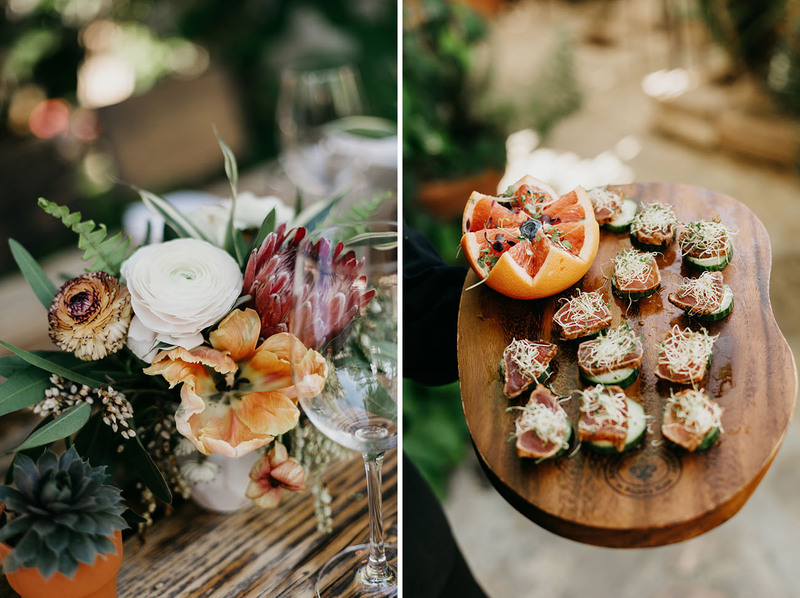 Incorporate vibrant cuts of fruit into the tablescape décor? Genius!! Danielle shares: I almost lost it when my dad, uncle and the groomsmen surprised me with the Haka. 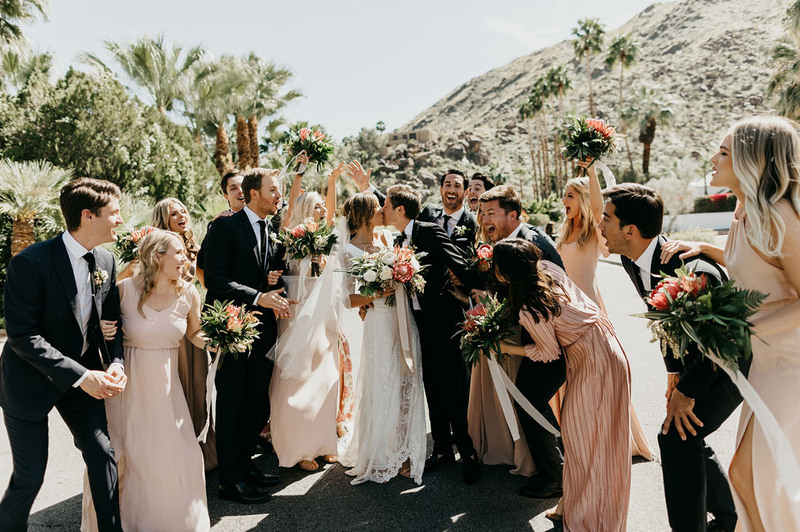 I had NO idea that they had planned (and practiced) this and it was such a special moment seeing my family traditions incorporated into the wedding. 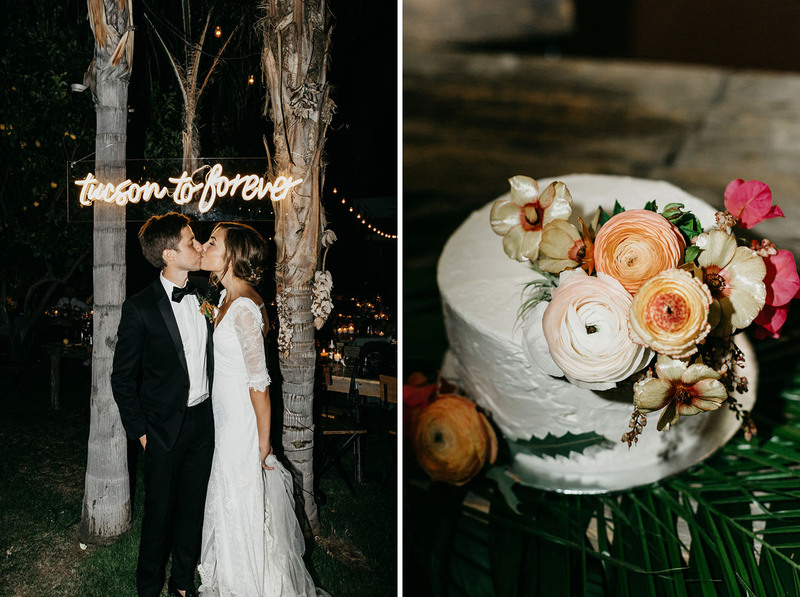 Tucson has such a special place in our hearts and we knew we had to include it in the wedding somehow — so what better way than with a neon sign?! 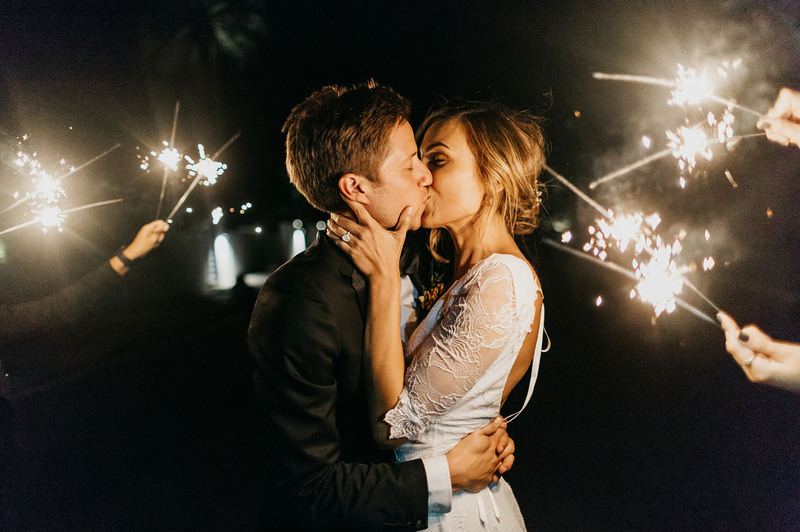 A sparkler exit for good measure! 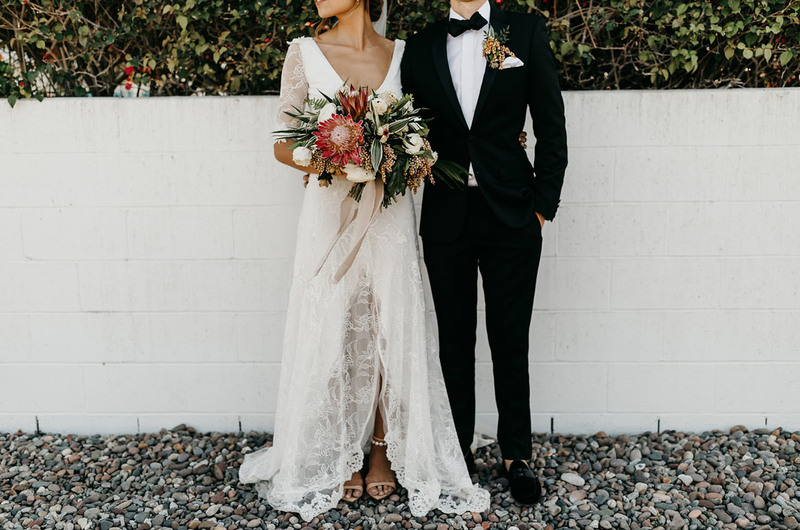 From the team at GWS, major congrats, Danielle + Jason!! 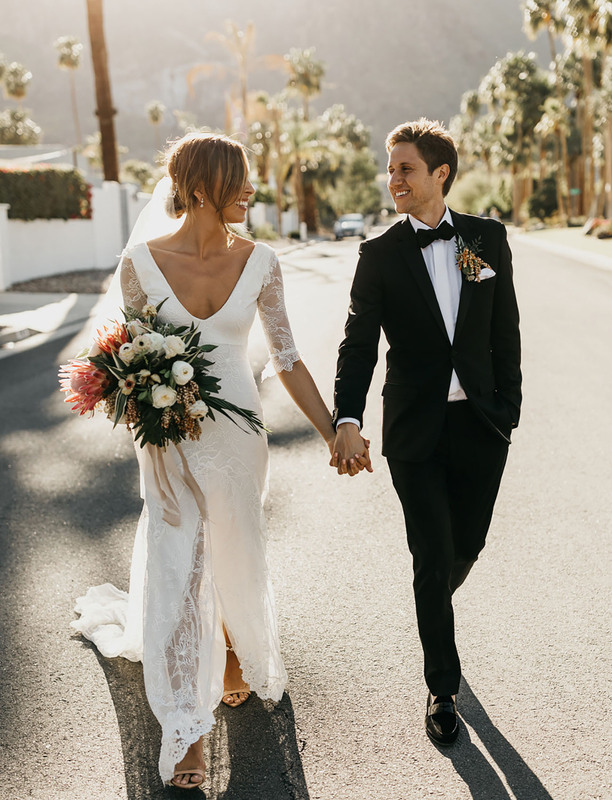 Want to dive a little deeper into their Palm Springs wedding? 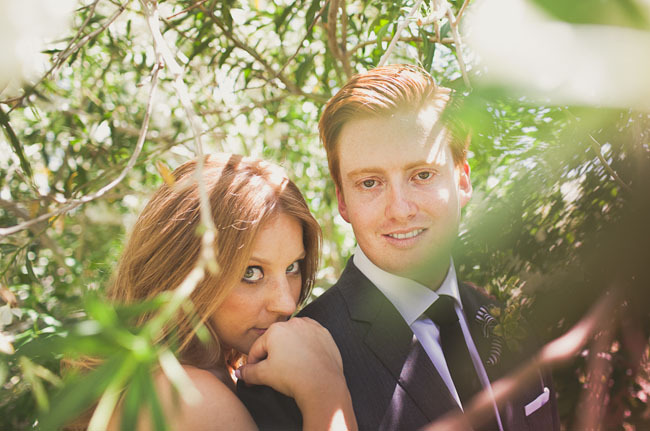 Take a look at this clip crafted by Leif and Jaci Films. Oh wow, love this whole day! 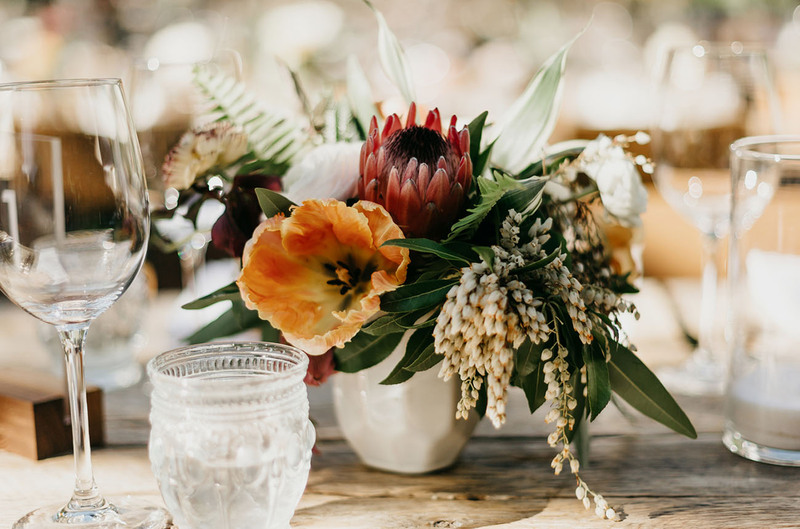 The flowers are now on my must have list. Bougainvillea! 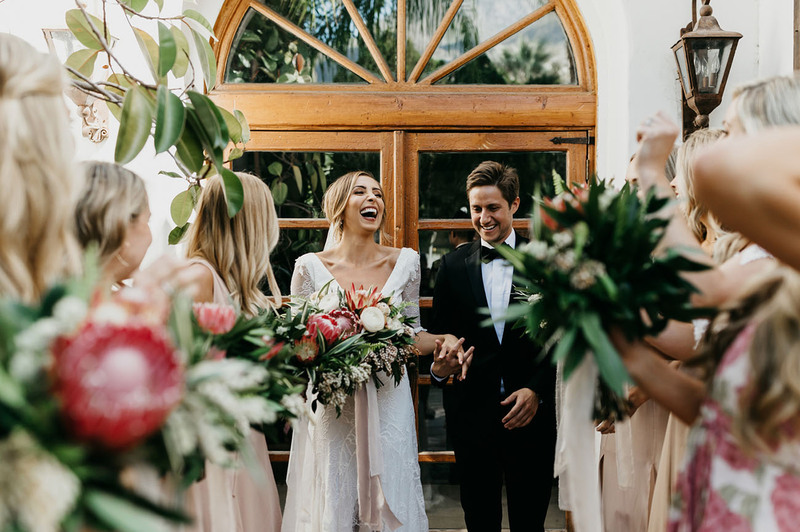 Bride and groom look so so happy, lovely to see! 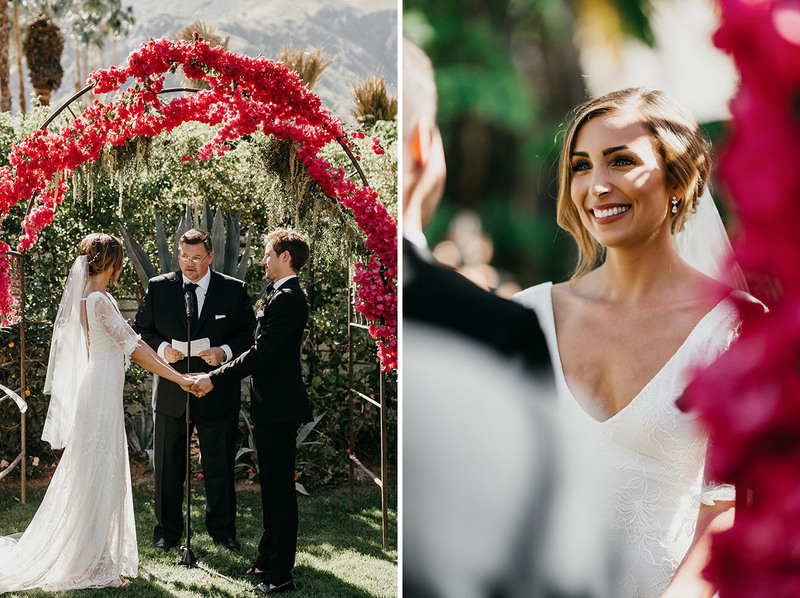 Love the dress and also love, love, love the floral arch at their ceremony…its colour is stunning! 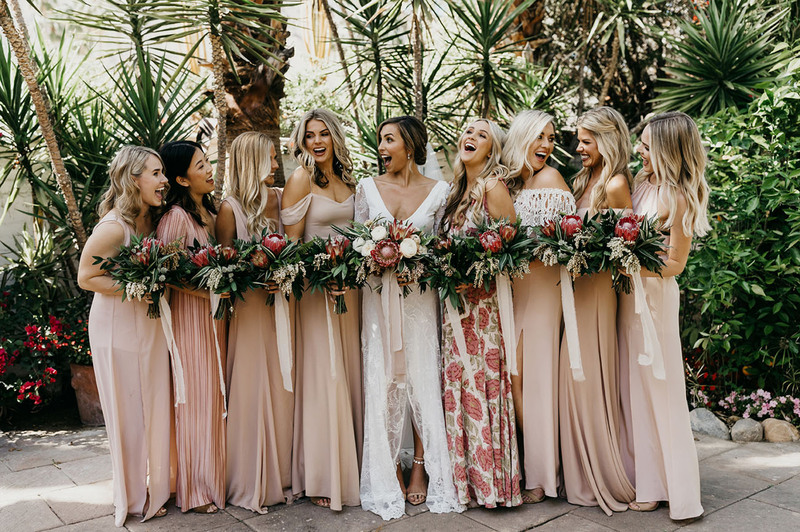 What flowers are they?